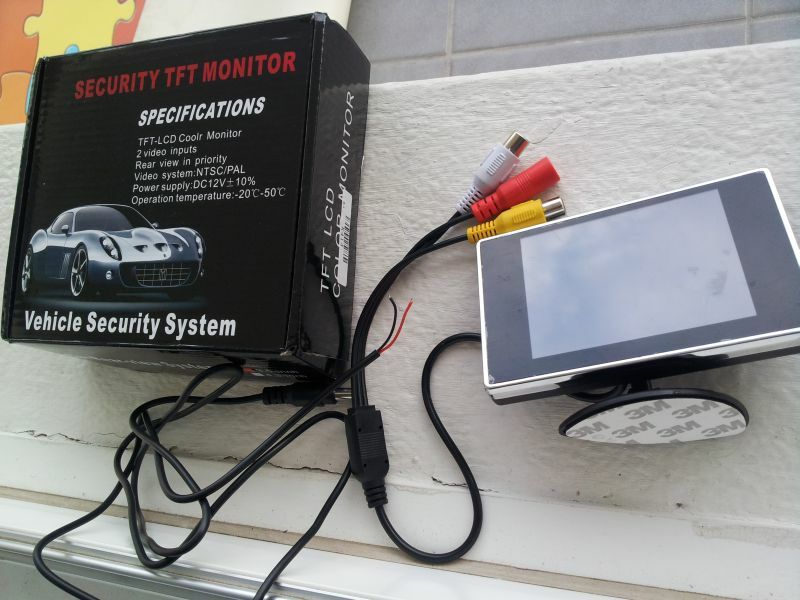 Modifying a 3.5" car display for USB power. A number of people have already posted about using this 3.5 inch display for their Pi's due to the low cost (£20.02 in the UK, I found if for under $18 from Amazon in the USA). The big downside is the need for 12V to power the display so here are instruction on how to modify it so that you can power it from USB. Tools/parts used: Small phillips screwdriver, soldering iron, wire cutters/strippers, USB cable, RCA male plug. 1) Open the display by removing the 4 screws on the back. If not back to the drawing board. Unplug the video/power cable. Unplug the ribbon cable to the display by sliding the black clip away from the body of the connector. It only moves a few mm, at which point the cable should slide out. DO NOT remove the black clip from the body of the connector. 3) Remove the two screws holding the board to the front housing. Take an old USB cable and cut it to the length you want for your power cable. Drill a hole in the display rear housing between the Menu and - buttons and slightly closer to the display edge. The hold needs to be just wide enough for the cable you have used. Feed the cable through the hold. 5) Remove the foam pad from the back of the PCB and put it to one side. the Locate and remove the 12V to 5V regulator chip (number 1 in the image below). If you have a soldering heat gun then that is the simplest method, if not then use a soldering iron and small knife or tweezers to lift each pin in turn. Don't worry about damaging the part, we're throwing it away. 6) Sanity check: Make sure your USB cable is threaded through the rear housing before this step or you'll have to re-do it. Trim back the white and green cables and leave them unconnected. Make sure they aren't somewhere that could short to the 5V line. 7) Take the power/video cable that came with the display and cut it just before the junction where it splits. (hint for people sensible enough to read all the instructions before starting, it's easiest to do this cut earlier, that way you can remove the cable from the housing and keep it from getting in the way). Sanity check: Make sure the cable is threaded onto the display rear housing and if applicable that the the body of the RCA connector is on the cable before proceeding. Strip back the cable and solder your male RCA plug on to the end. The yellow wire goes to the middle pin, the black to the outside. The white and red you can just trim back out of the way. This does result in a fairly short display cable but for a portable system that is normally what you want. 8) Put the foam back on the rear of the pcb and re-attach it to the front housing. Plug in the display input cable. 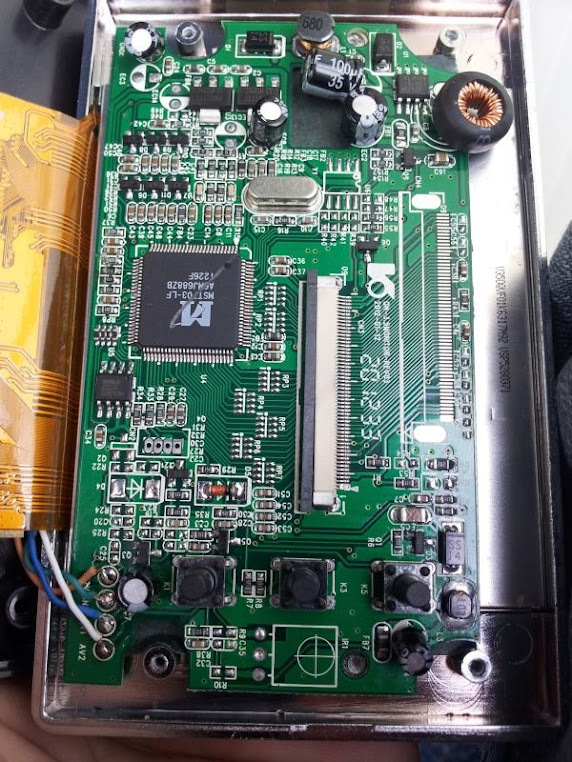 Check that the clip on the LCD ribbon cable socket is still in the open position (shown in the picture below). Slide the cable in to the socket as far as you can, take extra care that it's in square. Push the clamp down towards the body of the connector to lock the cable in place. 9) Put the rear housing back on, this is a little tricky due to the extra cables. I found that routing the USB cable between the screw post and the edge of the housing worked well for both keeping it in place and offering some strain relief. 10) Power the display and Pi from a USB power source. My display looked to take 300mA when running from 5V so if possible budget up to 500mA just to allow for variations. Having said that I plan to run both the display and Raspberry Pi from a single source that can supply up to 1A and don't expect to see any problems. Would it be possible for me to send you my screen and a usb cable for you to do it for me ??? I had a feeling the screen (I have the same one) would run off 5v if only I could get the wiring sorted out.. . I ended up going to Element14 and ordered a 5v to 12v Dc-DC converter (rated to 0.5A output) and a few bits of wire, strip board and switches etc to get the screen fired up from a 5v 1A mobile phone charger pack. that's all sat in a box ready for me to splice together with soldering skills not used in 10 years . I've had the screen fired up with 8xAA's and the Pi running off the charger pack so I'll give this a go instead and save the other bits for another project (when I can think of one... ). Are the red and white cables within the main pre-existing loom the +ve and -ve 12v feeds respectively? It seems to say that in step 7. Red is 12v power in. Black is ground for all the connections. White is the second video in. So if you move the red to the 5v in and remove the regulator then you can use the existing cable. Following a bit of probing around with a volt meter I managed to find a +5v pin on the board (off the back of one of the capacitors) so spliced the red wire in with a blob of solder. Fired up the screen and it immediately cut out , but it turns out it was just the power jack plug not being together properly. .
Just for clarification, if all you want to do is use a 5v input with the existing cable then all you need to do is cut the red wire coming in and solder it to the hole indicated for the red USB wire. 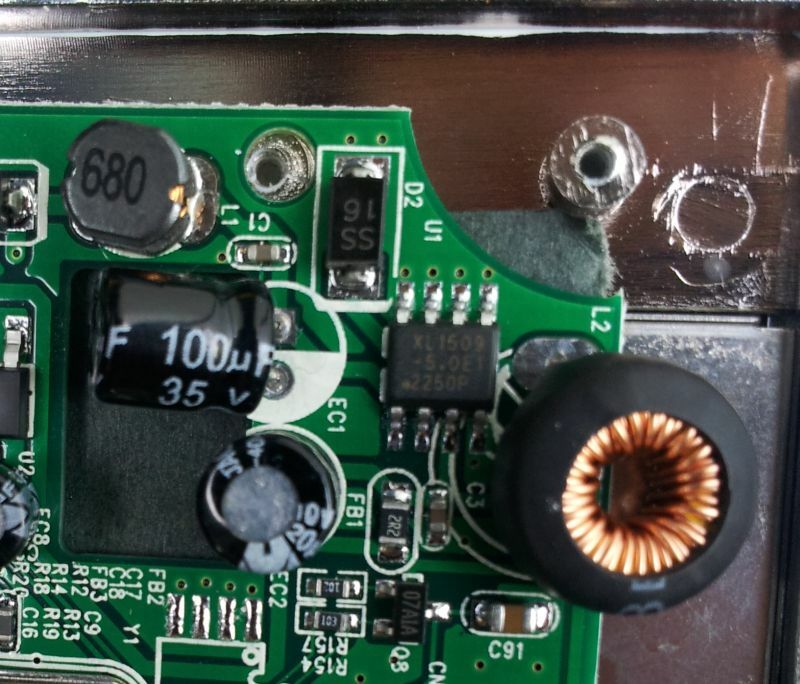 The reason for removing the chip is so that the voltage regulator doesn't have power on it's output with nothing connected to it's input. This is a precautionary move, it may not be necessary but is good practice. The rest is purely to give shorter and neater cables and to prevent someone connecting 12V power by accident. 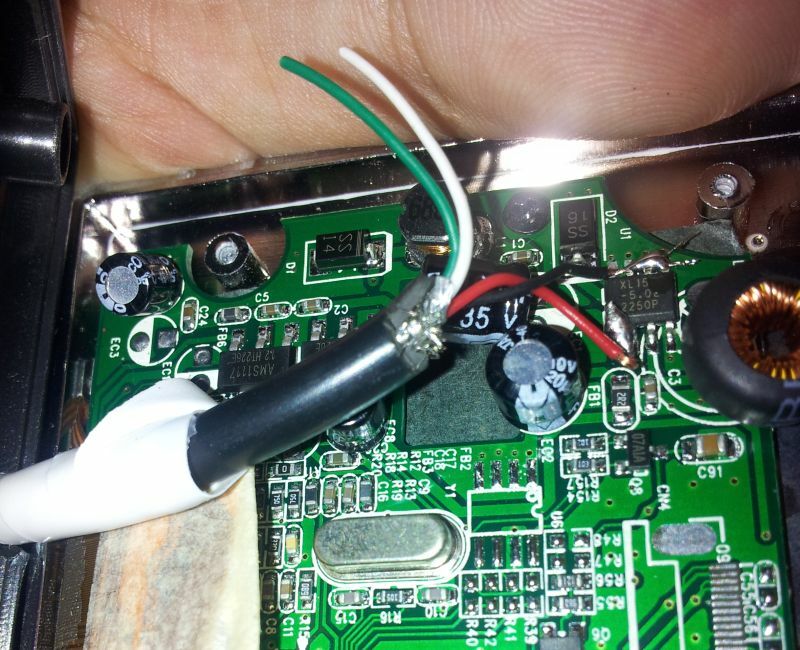 AndyA wrote: Just for clarification, if all you want to do is use a 5v input with the existing cable then all you need to do is cut the red wire coming in and solder it to the hole indicated for the red USB wire. Hello, I'm having some issues doing this. I cut the red wire on the power/video connector on the board and soldered the red wire to the 5v input in your image. and then plugged the power/video connector back in. I left the ground wire as is, is that correct? And on the dc power jack that comes with the display, I wired a USB connector to the end of it. When I try to power it up the screen flashes on then off again. This is using a 5v 1A USB wall charger. Wully wrote: Hello, I'm having some issues doing this. Wully wrote: And on the dc power jack that comes with the display, I wired a USB connector to the end of it. I just tried the exact modification you had made on a new display and it worked fine for me. Did you have anything connected to the video in connection and switched on? What you describe is exactly what you would see if there was no video input signal. Just for information, this display took ~120mA when powered from 5V with no video input and 400mA when active. Removing the no longer needed power regulator dropped that by 20-30mA. So for the two displays I've measured the power was 300mA and 380mA when running on 5V, a reasonably large unit to unit variation. I desoldered the red input wire on the 5V header and connected it back to the power/video input connection just to check it was working with 12V. It worked fine! I didn't realise it needed something connected to the video input to work. I thought it may have kept the screen backlit but blank if it was working. Silly mistakes I guess. I'll have a go connecting it back to the 5V header and actually connect a video input this time! Could I also confirm, when the display is powered on, initially it flickers on then off again. Then after 3-4 seconds it detects the video input (From input 1 or 2) and switches on. Is this 3-4 second delay consistent with your models? Wully wrote: Could I also confirm, when the display is powered on, initially it flickers on then off again. Then after 3-4 seconds it detects the video input (From input 1 or 2) and switches on. Is this 3-4 second delay consistent with your models? Yes, an initial flicker then blank for ~4 seconds before it wakes up. Thanks for such a detailed post. I just bought it from amazon.com[after reading this] for $18.99 + $4.99 S&H(total $23.98), not bad. When all this is done I'll have a nice diversion during long car rides, all for a lot less than most of the systems out there. Now to find an inverter with two USB ports. I'm using the same display and will be making the same mod (5 V). I would like to be able to switch the display off using GPIO. Can any one suggest a circuit for doing this. Do I need to use a relay or some kind of solid state switch. Any suggestions would be welcome, even if it only allows me to investige further. I redone it and wired the red wire to the 5V header. Connected a video input and a USB to DC cable and it worked perfectly! Thanks for the great guide and the extra help! Foggy wrote: I would like to be able to switch the display off using GPIO. Can any one suggest a circuit for doing this. The simple way is a total of 4 parts. Take an N channel MOSFET. Connect the gate to the GPIO pin, connect the source to ground and put a 1k resistor between the two. Now take a P channel MOSFET . Connect the gate pin the the drain on the N channel MOSFET. Connect the Source pin to the 5V supply. Put a 1k resistor between the source and gate pins. Connect the drain pin to the display power input. On the N channel part Vgs should be around 2V or less (we want the 3V from the Pi to count as a very definite on). On the P channel part Vgs should be around -3V or less. On the P channel part Is should be at least 1A. The N channel part is held in the off state by the pull down until the GPIO pin raises the voltage above the switch on threshold. Once this threshold is passed the N channel part turns on and connects the gate of the P channel part to ground. When the n channel is off the p channel is helf in the off state by it's resistor. When the gate of the P channel part is pulled enough below the source pin voltage that part turns on and connects power to the display. Since the GPIO pin is only connected to ground (via a resistor) and the FET gate pin (which is in theory completely isolated) it's well protected from the 5V line that could damage it. The resistor values are fairly flexible, I said 1k but anything from 1k to 100k should work fine. There is the assumption in this that the ground for the Pi and the ground for the display power are fairly well tied together, since they are connected by the video cable this should be the case, I'm just mentioning it here since it is a fundamental assumption. If the grounds aren't common then you would need to use a relay or some other system that didn't rely on a common ground. Thank you. I think I need to do some more reading. Hi! I bought this screen and once opened found that it has a slightly different board. Everything is working fine! the resolution is not good to do much text coding as i think it will tire your eyes very quickly but for some quíck and dirty things should be fine. Haven't tried video! The nice thing about FETs is that the current into the gate pins is 0* making them nice and easy to use. 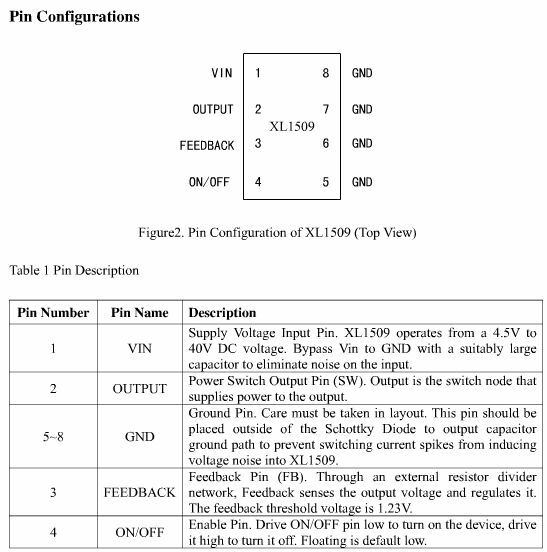 Since the Q1 source pin is connected to ground (0V) this means it is off until the GPIO input to the circuit goes over 2V. R2 is a small enough value that it will hold the gate at 0V if there is no clear input but large enough that it doesn't make it difficult for something to intentionally drive the input high. Point A is connected to the drain of Q1 which when Q1 is off is effectively not connected to anything. It is also connected to the gate of Q2 into which no current can flow. So while Q1 is off the only electrical connection to point A is through R1 which means point A is pulled up to 5V. Q2 is a P channel with a Vgs threshold of -2V. This means that the gate pin must be 2 volts below the source pin for Q2 to switch on. When switched off the drain pin of Q2 is effectively disconnected from it's source pin and so the power output from the circuit is disconnected from the battery. Since the source pin is tied to +5V this means that the gate must go below 3V to switch Q2 on. As previously noted, the Q2 gate is connected to point A and when the input signal is low point A is at 5V. So a low input means that the output power is off. When the GPIO input goes high Q1 gate goes to 3.3V. The voltage between the gate and the source is now 3.3V, well over the Vgs threshold voltage of 2V and so Q1 switches on. When Q1 switches on the Q1 Drain and Q1 Source pins are connected together by a fraction of an ohm resistance. Point A is now the midpoint of a resistor voltage divider. 5V is connected through R1 to Point A which is connected to 0V through Q1. Q1's on resistance (Ron) will typically be in the 0.1 ohm region. Assuming R1 is in the 1k ohm region this means that point A is now close enough to 0V to make no difference. Q2's gate is connected to Point A. It is now at 0V while Q2s source pin is still at 5V, this is far more of a difference than the -2V switch on threshold of Q2 and so Q2 switches on connecting it's drain pin to it's source pin and so connecting +5V to the power out connection. Since all the current needed by the device being controlled is passing through Q2 the on resistance for Q2 needs to be low and we want to make sure we drive it well past the threshold voltage (A 5V gate to source voltage difference Vs the 2V threshold) so that we are sure it is fully on rather than in some in between state. The currents in Q1 are far far lower and so this part is less critical. *OK, not technically true when changing state but a good enough assumption for this sort of thing. ** Again not technically true, there is a small leakage current but it's low enough to ignore in this situation unless R1 was several Mohms. marcialr wrote: Everything is working fine! the resolution is not good to do much text coding as i think it will tire your eyes very quickly but for some quíck and dirty things should be fine. Haven't tried video! One thing I discovered was that changing the screen resolution to something closer to the displays native settings made text far more readable. Obviously making the text larger helps a lot but it also seemed to reduce the flickering nature of the image I was seeing. I came up with these settings via trial and error and what seemed to look better to me rather than any scientific objective method so your mileage may differ but it's certainly worth having a play. Thank you for taking the time to try and explain. Would some thing similar to this work and adding the resistors as you have shown. I accept that Vgs does not have exactly what you suggested, but if I am on the right track then I will keep looking. Foggy wrote: Would some thing similar to this work and adding the resistors as you have shown. The Vgs is fine, a lower threshold (meaning closer to 0 since for the p channel part it's negative) isn't normally a problem. I would make sure R2 isn't too large, I think the Pi has internal pullups on the GPIO pins, these are normally in the 100kohm region (I've not looked at the ones on the Pi specifically). You want to ensure that any voltage divider formed by the internal pullup and R2 gives a voltage that is below the threshold so that Q1 is always in a known state if the circuits input is not being actively driven. In other words you will probably want to keep it under 10k. The only potential issue is the Rds on for the P channel part is a little higher than I'd like (max of 0.27 ohms for a Gate-Source voltage you'd end up with). That means that with the display taking 0.4A you could be dropping up to 0.1V in the transistor, not enough to matter but more than ideal. This is mainly me being excessively fussy, that part should work fine. Nice job Andy, I was coming on to ask if anyone had a solution for the small text. The only issue I've got with these settings is due to the resolution a lot of text in the terminal is cut off. I'll have a mess around to find what I need. Has anyone found any good uses for the screen so far? Thanks for the guide - going to try a mod for mine today! After tweaking with the settings I have the optimum configuration for using the whole of the screen while maintaining good readability.